What can one expect when one learns that the executive chef of a star hotel has worked in hotels in Indonesia, Singapore and China and some other countries? A quick scan through the menu confirms it - Asian specialties. Yay!! 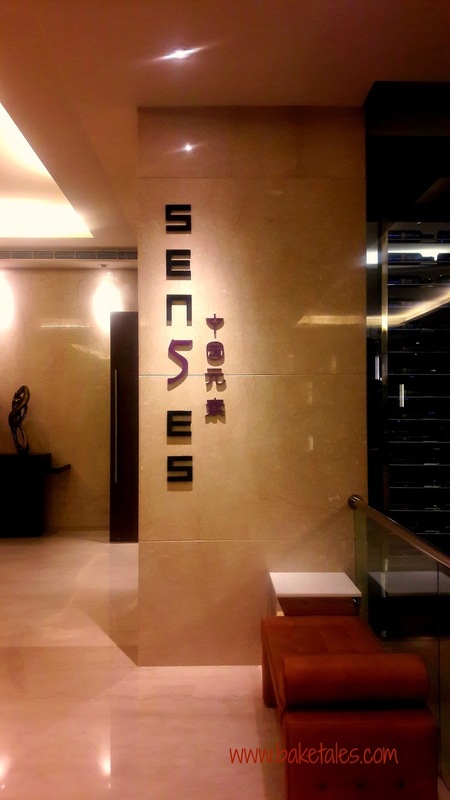 This year, on Chinese New Year's day, a celebration of sorts took place at Westin Hotel Velachery when the Chennai-based hotel opened its chic Chinese restaurant Five Sen5es. In an earlier avatar, the space was known as EEST, well-known for its dimsums. 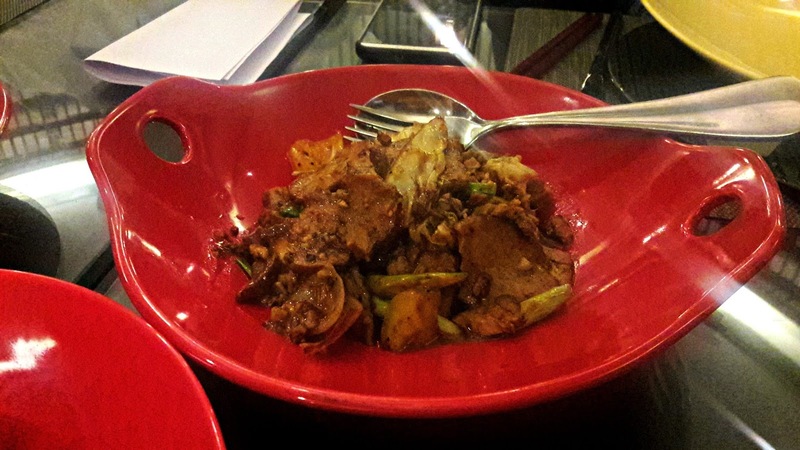 Although Five Sen5es is labelled a Sichuan specialty restaurant, the menu lists several pan- Asian specialties and other Chinese regional offerings. Seating is arranged in 2 large circles. The inner circle where we are seated, reminds me of a birdcage, wooden slats demarcate it from the outer arrangement. On one wall are panels with Chinese characters and a dragon weaves its way between them, its eye a pop of light and colour. On another side, a glass wall allows the diner to look into the kitchen. Off and on, flames leap out from the woks and that adds to the drama. Even though it is midweek, the restaurant is pretty full. Oriental music plays over the system, thankfully we don't have to shout over the music to be heard. Several tiny laughing Buddhas and other Chinese curios are stacked on the shelves of a room divider. It's a space radiating peace and harmony, just the setting to enjoy an Oriental meal. We chat with Executive Chef Yatendra Rawat about work, travelling and ingredients. What's interesting is that there is something on the menu from every country he has worked in. We start with an assortment of sushi - togarashi salmon, California roll studded with roe and vegetable futomaki for my vegetarian friend. 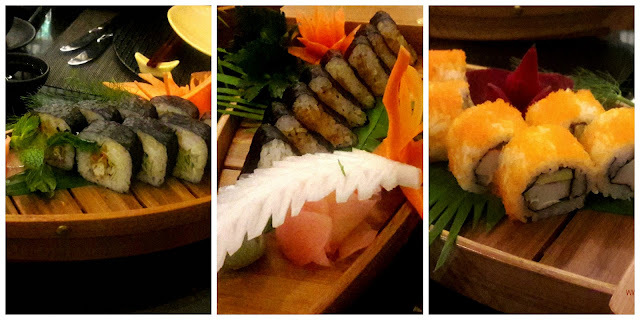 Served in boat shaped trays, all three are really good but the wasabi could do with a little more punch. 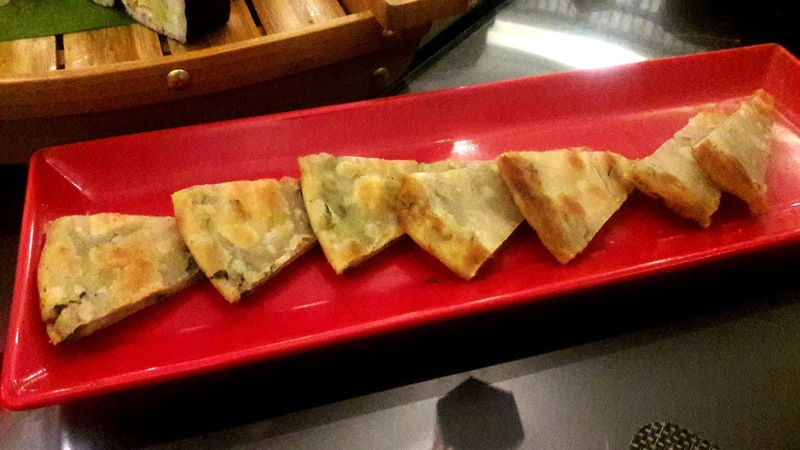 The scallion pancakes, speckled with scallions and a hint of 5 spice powder, are crisp, good enough to be eaten on its own. Chef Rawat tells us that in China, they are cooked in lard which make them even more flaky. Soto ayam, an Indonesian soup is what I'm served. 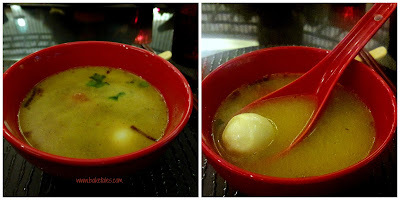 The thin soup with the flavour of lemongrass and fried onion is delicious. There's chicken as well as tiny cubes of potato and a quail egg in the soup. The main course is Hot Basil Fried Rice. Oh yes, the sliced chillies in them are hot indeed and it's a winner of a dish. The little pearly grains have fragrance from both the jasmine rice and the mild aniseed aroma and flavour of basil. Bits of vegetables add texture to the whole. 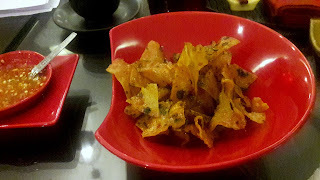 Tofu in Chengu sauce has deep fried cubes of cotton tofu that are crisp on the outside while the inside is soft and the whole is coated with the slightly spicy, slightly tangy, slightly sweet sauce. Utterly utterly delish! 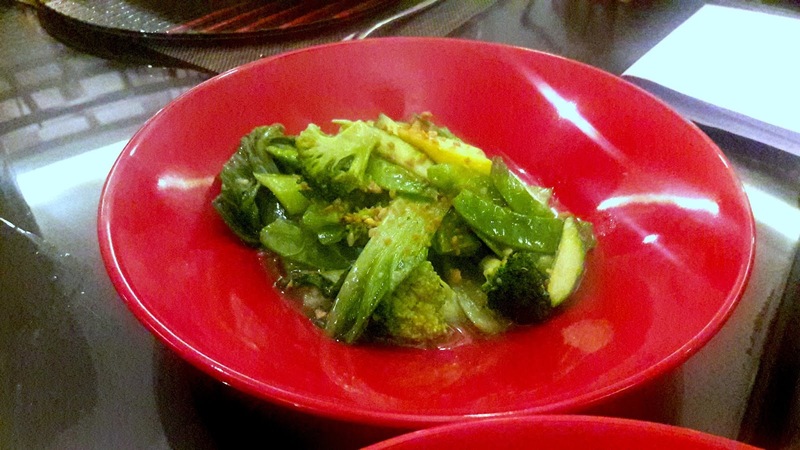 Cantonese-style stir fried greens has bok choy, broccoli, snow peas and zucchini. The greens, seasoned with garlic and sauces, are perfectly cooked and retain their crunch and colour. Sichuan twice cooked pork is tender and there's capsicum, onion slices and Napa cabbage that make it a dish of textures. It's a little spicy and I love the dash of 5 spice powder that adds another dimension to the dish. 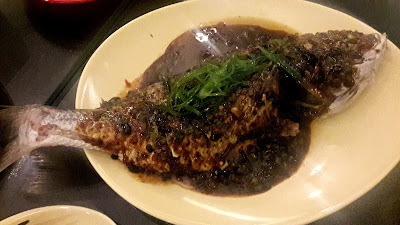 A whole snapper steamed in black bean sauce makes its entrance. The black bean sauce is a perfect contrast in every way to the fish - the delicate, moist, white flesh of the fish goes perfectly well with the savoury heartiness of the black bean. This one deserves top marks for balance of flavours. And just like how it is served abroad, the fish has its tail intact. 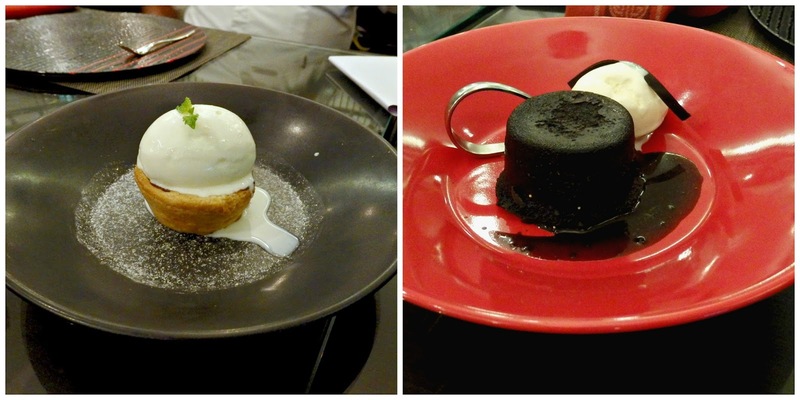 We have a trio of desserts to taste - Portuguese egg tart, pumpkin pudding and flourless chocolate cake. The clear winner is the pumpkin pudding - the chilled medley of coconut milk, brown sugar and super-smooth pumpkin puree is fascinating. We are told it's the most popular dessert on the menu and that's not surprising at all. The tart pastry is a bit of a let down as it wasn't crisp but the custard filling tasted nice, though it was not the egg yellow colour it usually is. It's served with a scoop of ice cream. We were asked to identify the special ingredient in the chocolate cake. 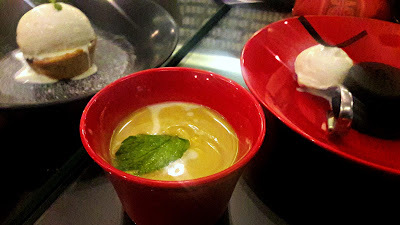 At first bite, it tasted like a velvety smooth marquise but with the second bite, the flavour of lemongrass was discernible. Five Sen5es is open only for dinner, from 7 - 11 pm. Do call 044 66333777 for reservations.